The St. Thomas Anglican Church in Middle Island is now in a better financial position thanks to a recent donation from the Lawrence School of Music. During a brief ceremony the school donated $8,000 which was raised the music school’s 37th annual Pianoforte concert in July. In making the presentation, Lady Hulda Lawrence gave thanks to God for the gift of music; and for the talents he has given us that we can use in his service and to help others. The cheque was accepted by Rev. 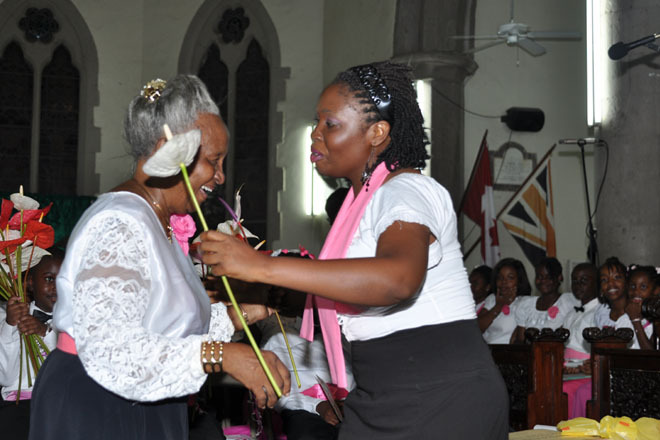 Yvette Bagnall and treasurer Sharon Sillidy of the St. Thomas Anglican Church. Rev. Bagnall thanked the music school for its generous donation and noted that it would aid in the repair of the church roof. On a previous occasion, the music school donated $2,000 to the parents of a child receiving medical treatment abroad. Meanwhile, the school continues its monthly food programme to needy persons in the community. The Lawrence School thanks all who attended the concert or gave their support in any way.